The maps and charts below explore the American Community Survey 5-year data (Table S1810) on disability estimates by county type (OMB county classifications) and US Census Regions and Divisions. The ACS asks a set of disability indicator questions to determine disability. If a respondent can answer “yes” to any disability question they are classified as having a disability. As shown in the charts below, the trend of increased disability rates in rural areas as compared to metropolitan areas holds at both the regional and divisional level. Chart of Rates of Disability by Census Region and Metropolitan Status. This chart depicts rates of disability in four regions of the United States by metropolitan status. 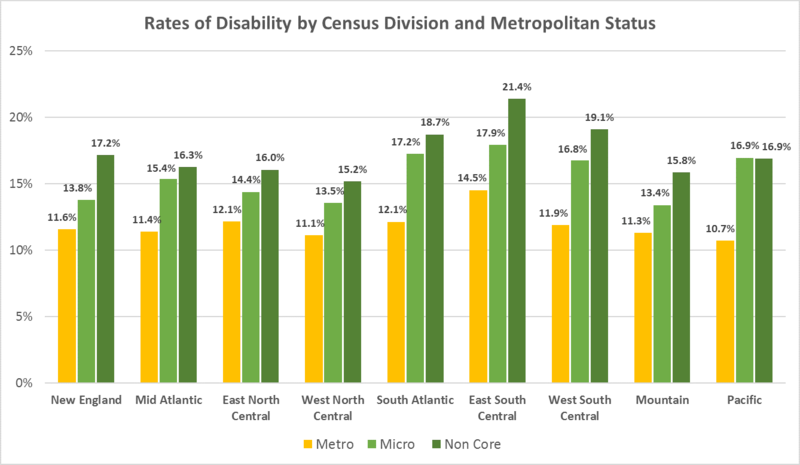 In each region, disability rates are highest in non-core areas and lowest in metro areas. The South non-core region has the highest disability rate, at 19.7%. The West metro region has the lowest disability rate, at 10.9%. 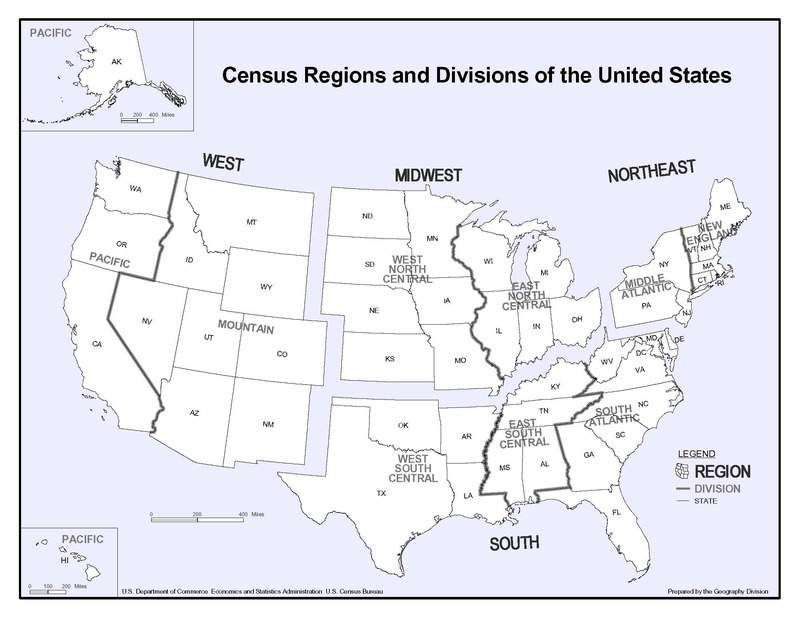 See below for a map of the US Census Regions. Chart of Rates of Disability by Census Division and Metropolitan Status. This chart depicts rates of disability in nine regions of the United States by metropolitan status. 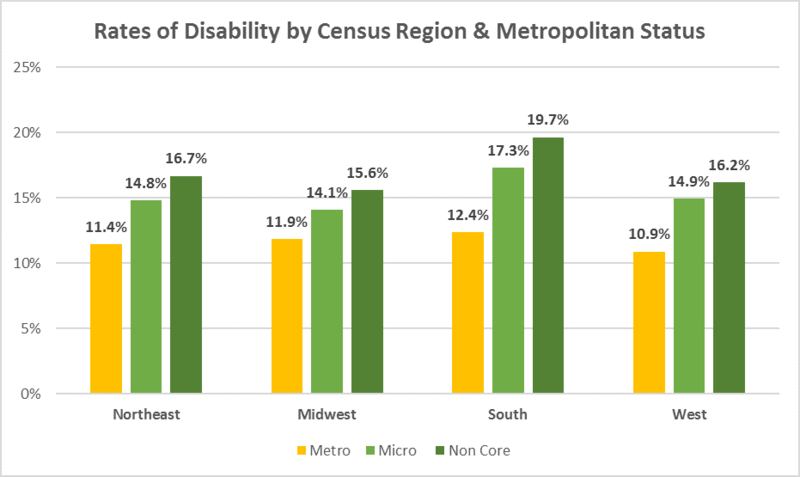 In each region, disability rates are highest in non-core areas and lowest in metro areas. The East South Central non-core region has the highest disability rate, at 21.4%. The Pacific metro region has the lowest disability rate, at 10.7%. See below for a map of the US Census Divisions.